Dinithi has a background in psychology and has over 12 years of experience in conducting empirical research. Before joining the Hadley Centre in 2007, she was invited by the Ministry of Health of the Government of Sri Lanka, on a UNICEF-funded project, to adapt and standardise a developmental screening test for infants and pre-school children. 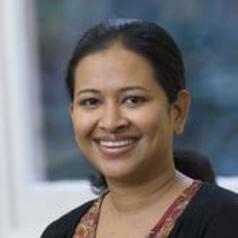 Since joining the Hadley Centre, a number of research studies that Dinithi has undertaken, individually and with colleagues, have led to significant policy and practice developments: for example the Sri Lankan Government changing its policy on early developmental screening; the UK government issuing directives to local authorities on adoption and inter-agency payments, which led to changes in practice; and impact on policy formation for children in the care system in the UK, such as changes to statutory guidelines on matching a child with potential adopters. Dinithi is currently leading a study funded by the ESRC to establish the prevalence and characteristics of children growing up in kinship care in the UK through analyses of Census microdata. Key areas of expertise: Secondary data analyses in child welfare research (experience of analysing data from the Longitudinal Study of Young People in England; SSDA903 data of looked after and adopted children; and the Census microdata); Advanced quantitative data analysis; Mixed methods research in adoption, fostering and kinship care; Developmental assessment and test standardisation.